We will begin with 10am Mass, and followed by one decade of the Holy Rosary. We will then process by car to the abortion facility, continuing our Rosary on the way. 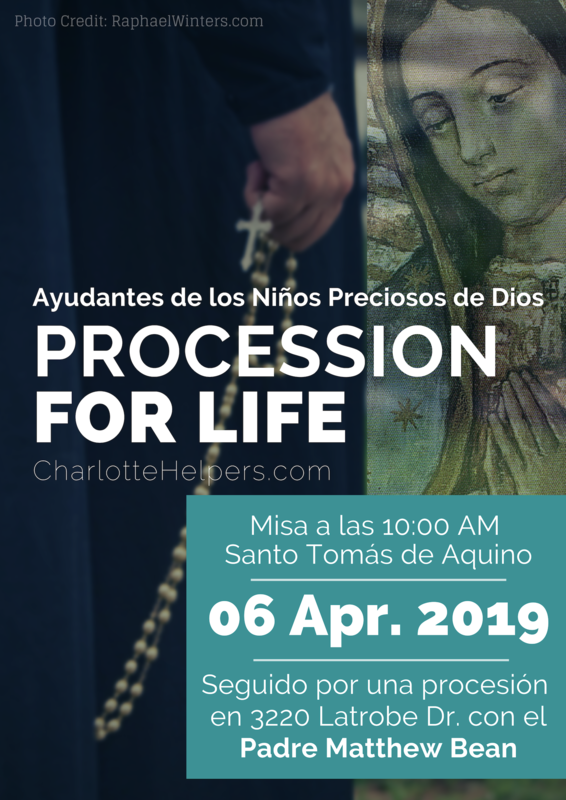 *The Procession for Life will begin sometime around 9am, depending on the length of Mass and travel time. Park down the road from the clinic, where you see the Our Lady of Guadalupe banner. Gather at the banner and we will process up to the clinic as a group. Prayer with Fr. Bean will last about 30-35 minutes on the sidewalk. There will be Eucharistic Adoration happening at the parish while we are at the abortion mill, for those who cannot join us but who wish to spiritually unite with our intentions as we stand as a public witness for the sanctity of human life. Or right click to save the below image to post on social media. Iniciaremos con la Misa a las 10:00 am seguida por una década del Santo Rosario, seguida por la procession en carro hacia las instalaciones de A Preferred Women’s Health, continuando con el Santo Rosario en el camino. *La Procesión por la Vida comenzara alrededor de las 11:00 am, dependiendo de cuanto tiempo dure la Misa y el trayecto hacia la instalación. •Después de estacionarse, favor de agruparse detrás de la bandera de Nuestra Señora de Guadalupe, ya que haremos la procession en conjunto. •Oración con el Padre Matthew Bean durará aproximadamente unos 30-35 minutos en la acera. •De no poder acompañarnos en la procession, habrá Adoración a la Eucaristia en la Iglesia Católica Santo Tomas de Aquino. De esta manera podra unirse espiritualmente mientras apoyamos la santidad de la vida humana. Acompáñenos y compartalo con sus amistades. The Charlotte chapter of the Helpers of God’s Precious Infants holds 4 large vigils each year in January, April, July, & October. If you’re interested in praying regularly at our Charlotte abortion clinics, there are two additional options for monthly prayer with our diocesan priests (see below). These are not the Helpers of God’s Precious Infants events. Each 1st Saturday Fr. Buettner and his St. Michael’s parishioners pray at the Latrobe Dr. abortion clinic near the Uptown/East Charlotte area. Each 4th Saturday Fr. Reid and his St. Ann’s parishioners pray at the Hebron Rd. abortion clinic in the South Charlotte area. You can contact the Charlotte Helpers and ask to subscribe to our e-newsletter where we will email you the upcoming Procession for Life information. JANUARY 2018: Jan. 27th @ Charlotte Catholic High School: 9am Mass followed by 10am procession and prayer at Hebron with Fr. Jason Barone. APRIL 2018: April 28th @ St. Matthew Catholic Church: 9am Mass followed by 10am procession and prayer at Latrobe with Fr. Christopher Bond. JULY 2018: July 28th @ St. Gabriel Catholic Church: 9am Mass followed by 10am procession and prayer at Latrobe with Fr. Gabriel. OCTOBER 2018: October 20th @ St. Thomas Aquinas Catholic Church: 10am Mass followed by 11am procession and prayer at Latrobe with Fr. Bean. JANUARY 2017: Jan. 14th @ Charlotte Catholic High School: 9am Mass followed by 10am procession and prayer at Hebron with Fr. Jason Barone. APRIL 2017: April 8th @ St. Gabriel Catholic Church: 9am Mass followed by 10am procession and prayer at Latrobe with Fr. Gabriel. OCTOBER 2017: October 21st @ St. Vincent de Paul: 9am Mass followed by 10am procession and prayer at Hebron with Fr. Voitus. OCTOBER 2016: October 15th @ St. Vincent de Paul Catholic Church: 9am Mass followed by 10am procession and prayer at Hebron with Fr. Coleman. APRIL 2015: April 25th @ St. Thomas Aquinas Catholic Church: 10am Mass followed by 11am procession and prayer at Latrobe with Fr. Jason Christian. APRIL 2014: April 5th @ St. Vincent de Paul: 9am Mass followed by prayer at Hebron with Fr. Shaw. JULY 2014: July 19th @ St. Basil’s Eastern Catholic Mission. 9:30am Divine Liturgy at St. Thomas Aquinas parish in the chapel followed by prayer at Latrobe led by Fr. Mark Shuey and Fr. Deacon Matthew Hanes. Adoration while we’re at the clinic will be in the chapel which is across the courtyard from the church. AUGUST 2014: August 30th @ St. John Neumann. 8am Adoration followed by 9am Mass and then prayer at the Latrobe Dr. abortion clinic with Fr. Hoare. SEPTEMBER 2014: 1st Saturday at Latrobe with Fr. Buettner or 4th Saturday at Hebron with Fr. Reid. No official Charlotte Helpers event (we are moving to just 4 large vigils a year) please join these priests in their monthly ministry! OCTOBER 2014: October 25th @ St. Mark’s. 9am Mass followed by prayer at Latrobe with Fr. Putnam. NOVEMBER 2014: 1st Saturday at Latrobe with Fr. Buettner or 4th Saturday at Hebron with Fr. Reid. No official Charlotte Helpers event (we are moving to just 4 large vigils a year) please join these priests in their monthly ministry! DECEMBER 2014: 1st Saturday at Latrobe with Fr. Buettner or 4th Saturday at Hebron with Fr. Reid. No official Charlotte Helpers event (we are moving to just 4 large vigils a year) please join these priests in their monthly ministry! APRIL 2013: April 20@ St. Ann’s: 9am Mass with Fr. Reid, followed by prayer at Hebron. MAY 2013: May 25 @ St. Thomas Aquinas: 10am Mass with Fr. Kauth, followed by prayer at Latrobe with Deacon James. AUGUST 2013: August 17 @ St. John Neumann: 8am Eucharistic Holy Hour, 9am Mass with Fr. Hoare, followed by prayer at Latrobe.